Church of Hagia Sophia in Thessalonica, Greece. The Church of Hagia Sophia, Greek: Ἁγία Σοφία - Holy Wisdom, is among the oldest churches in the city of Thessalonica in northern Greece. The church is located in the center of the city. 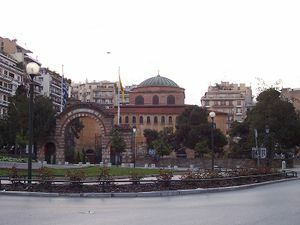 The present Church of the Holy Wisdom in Thessalonica was built in the eighth century on the site of an earlier church built in the third century. Based upon the Church of Hagia Sophia of Constantinople, its ground plan is that of a basilica with a nave and two aisles combined with the Greek cross plan beneath a dome. Through the centuries, the church has seen changes that reflect the political as well as religious environment that Thessalonica has experienced. As originally built the church is an example of the architectural style typical of the Byzantine middle period. During the era of Iconoclasm in the Eastern Roman Empire of the eighth century, the apse of the church was modified to a plain gold mosaic surface showing only one great cross that was similar to that of Hagia Irene in Constantinople and the Church of the Dormition in Nicea. After the victory of the Iconodules in 787-797, the cross was replaced with the image of the Theotokos. Dating from the ninth and tenth centuries the mosaic in the dome is that of the Ascension of Jesus Christ with the inscription from Acts 1:11, "Ye men of Galilee, why stand ye gazing up into heaven?". The dome is ringed by the images of all Twelve Apostles, the Virgin Mary, and two angels. In 1205, Hagia Sophia was converted into the cathedral of Thessalonica by the Latins when the city was captured by the Fourth Crusade and remained so after the city returned to the control of the Byzantine Empire in 1246. After Thessalonica was captured by the Ottoman Sultan Murad II on March 29, 1430, the church was converted into a mosque, but nor until 1585. While still a mosque, Hagia Sophia was damaged in a fire during 1890 and was subsequently restored during 1907 to 1910. After Thessalonica was freed from Ottoman control in 1912, the church was rededicated for Christian worship later that year. During the Great Thessalonica Fire of 1917 the church was damaged seriously, resulting in the plastering of much of the interior decoration. During World War II, the church lost its Turkish portico during an Italian air raid in 1941. Hagia Sophia was again damaged badly in 1978 during an earthquake. This damage was repaired, in addition to restoration of the dome, in 1980. This page was last edited on January 12, 2013, at 02:02.